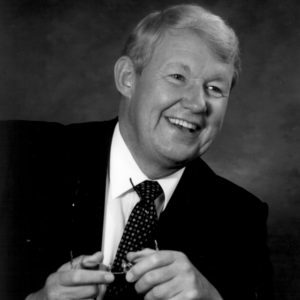 LYNDEN, WASHINGTON (ANS)—The first time I heard the marvelous British accent of Dr. Richard A. Bennett was from the pulpit at Calvary Chapel Costa Mesa. He was teaching a lesson (as he often called sermons). I was struck by the profound, yet simple insight Bennett gave to the text. I knew right then and there Dr. Bennett was a man of deep faith and practical insight. 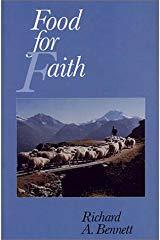 Prior to Dr. Bennett’s teaching, I was aware of Bennett from two of his books, Food For Faith and Your Quest For God. Both were highly regarded works on real-world Christianity, held in high esteem by various Christian leaders. But these weren’t the only books Richard wrote; at least eight books were penned, leaving a lasting legacy on how to live a victorious Christian life. Little did I know that Dr. Bennett and his lovely wife, Dorothy, would move down the street from me in Santa Ana, California. Residing in the missionary house of Calvary Chapel Costa Mesa, Richard and Dorothy were invited by Chuck Smith to continue their international ministries under CCIM and use their valuable ministry and teaching skills as the Lord might lead. The congregation was blessed beyond measure during their tenure. Over two years together, we had many of marvelous tea times and meetings. One of the things that struck me is that Richard always insisted on praying before our gathering and at the conclusion. And what prayers they were! Some of the most heartfelt and eloquently simple utterances, recognizing God as both Father and Sovereign. I felt as though we were entering heaven as he prayed. And I may add: as Brits, Dorothy and Richard knew how to pour a good cup. At our meetings—or often times ministry discussions in my office, we shared our deep passion for the Bible and the expository teaching of the text. As mentioned, Richard was passionate about rightly dividing the word of truth (2 Timothy 2: 15). His fervent, evangelistic plea to live a holy life before a holy and loving God was not something he gave lip service to; he lived it. The Lord led the Bennett’s to return to their Washing state base about the time I left for Calvary Church Albuquerque. In Washington, they continued with the Cross Currents International Ministries they’ve faithfully served for years. However, our communication didn’t cease. Through Dorothy’s lovely monthly prayer letters and updates, and a couple of phone calls, I kept in regular touch with Dorothy and Richard. And when they asked me to be the reading voice for one of Richard’s books, I jumped at the chance. As I read the work in a studio, I thought often of Dorothy and Richard, using my time—as we so often did together—praying for them and others. Richard meant much to me as a mentor, friend, and faithful servant of Christ. I can’t express how greatly his ministry and life will be missed. To help celebrate the life and witness of Dr. Richard Bennett, I leave you with the obituary Dorothy sent me. May Richard’s works and witness be an inspiration for all! Richard went home to his Lord and Savior on January 17th and is now is rejoicing in presence of our Lord Jesus Christ. “But thanks be to God which giveth us the victory through our Lord Jesus Christ” (1 Corinthians 15:5). 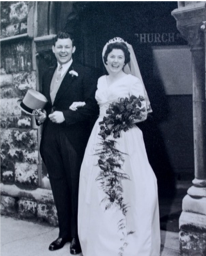 Richard is survived by his wife of over 60 years, Dorothy. 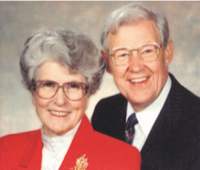 Through his international ministries, countless of others hold both Richard and Dorothy dear to their hearts. At the age of 19 in 1946, Richard received the Lord as his personal Savior. Immediately, he began to confess Christ to others and increasingly he was asked to preach in local chapels and in home meetings. So much so, that he faced the challenge to leave his secular job – even though it offered security for the future – and embark on a life of total dependence upon the Lord. Like so many other believers who have taken this path, he had many stories he could share of the Lord’s timely care, guidance and blessing. He learned the need to totally depend upon the Lord and, instead of attempting to work for God, to be available for God to work through him. The Lord then opened up a door for biblical studies in the States and, at the same time, he was invited to become a Pastor of a Rhode Island Church. Upon completion of his studies, he returned to work with his father in Christ, Stephen Olford, who was the pastor of a large London church. That is the place where Richard and Dorothy first met and were married, after which they embarked on an itinerant ministry. The Bennett’s ministries included bringing biblical encouragement to persecuted believers which often took them to such difficult places as the Middle East, behind the “Iron Curtain” in Europe, and the African country of Uganda immediately following Idi Amin’s leadership. In 1967, a Christian Committee in England asked Richard to preach a couple of messages for their new radio program called The Living Word. With such small beginnings, Richard and Dorothy had no idea that the Lord would significantly expand further wide missionary radio opportunities. Unbeknownst to Richard and Dorothy at that time, Dr. Paul Freed, co-founder of Trans World Radio, had been listening to Richard’s radio messages. Then one Sunday morning in 1969, Dr. Freed returned home from Europe and met his family at church just in time to hear a guest speaker. Recognizing the voice to be that of the same man he had been listening to from Monte Carlo, he knew this was the Lord’s timing to meet. So, after that morning service, Dr. Freed eagerly urged Richard to undertake the responsibility of producing his own weekly broadcasts on TWR. After praying about this radio proposition, Richard acted on the promise from Isaiah 61:8, “I will direct their work in truth.” Hence, The Way of Truth was born and Richard and Dorothy’s New Jersey organizational title, Missionary Radio Incorporated, was used. 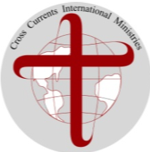 Because of other expanded ministries, their non-profit organization then became Cross Currents International Ministries in 1980. About that time, Richard and Dorothy commenced broadcasting into all of India from FEBC, Manilla and also targeted Cuba in the Spanish language from FEBC, San Francisco. Many nationals and missionaries wrote of their appreciation for our 15-minute weekly biblical challenge, The Way of Truth. Then, with only volunteer assistance, CCIM became incorporated in Canada, the Grand Bahamas, the British Isles, South Africa as well as the United States. 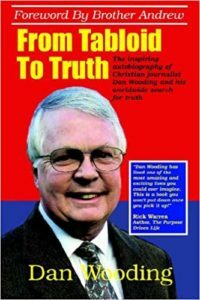 The Way of Truth was heard in 25 European countries, in North Africa and the Middle East over medium wave, Monte Carlo. 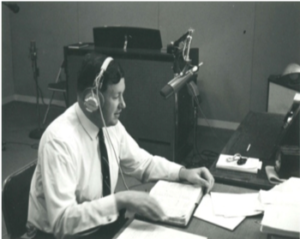 Scripts of Richard’s radio messages were also typed and shared with national broadcasters for their biblical assistance in producing their own linguistic programs. Together, Richard and Dorothy were aware of the awesome privilege and responsibility of sending forth His Word into very spiritually dark places. Dr. Freed was a great encourager. In his signed 1972 copy of his excellent documentary book Towers to Eternity, he wrote: “Richard, We thank the Lord for your wonderful ministry.” “The Lord hath done great things for us; whereof we are glad” (Psalm 126:3). Through much prayer and the enabling power of our risen Lord Jesus Christ, their cooperative fellowship with TWR increased. Each time they met humanly insurmountable difficulties; the Lord always gave them His solution and quietly “directed their work.” Very often Richard and Dorothy had to learn the hard way to totally trust by faith and depend upon their precious and risen Lord! meet the spiritual needs and urgent requests from Africa, Europe, Latin America, the Far and the Middle East. By faith and much travail against spiritual warfare, the Lord enabled them to translate and print over one million books. 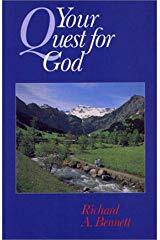 Richard Bennett wrote Your Quest for God and witnessed how much benefit it brought to the many peoples in other countries. Through the wide open door of Internet, Your Quest for God reached a new audience, along with his other books Food for Faith, Biblical Reality, Forward in Faith, By My Spirit, Inside the Soul, Light and Glory and Revival Now. These books are also reaching persecuted and deprived believers on many continents in audio format and are available for free download from www.ccim-media.com/resources. Presently, the much-published Salvation/AIDS tract, Hope for the Hopeless, which Richard wrote, is now in audio format and proving to be a vital tool for CCIM and TWR’s evangelistic outreach to many people in many languages. As a husband/wife team for over 60 years, the combined foundational biblical teaching of Dorothy’s Daily Devotionals with Your Quest for God offered spiritual help and encouragement, and many individual radio listeners, families and groups are richly blessed! Together, these ministry tools continue to support their worldwide outreach for His glory, as the Lord outworks His plan and purposes. With such words of comfort, joy and assurance, we can gratefully say: “Now thanks be unto God, which always causeth us to triumph in Christ, and maketh manifest the savour of his knowledge by us in every place for we are unto God a sweet savour of Christ, in them that are saved, and in them that perish: To the one we are the savour of death unto death; and to the other the savour of life unto life. And who is sufficient for these things?” (2 Corinthians 2:14-16). A Memorial Service will be held locally in Lynden, WA; your prayers are much appreciated for the ongoing ministries.